KINGSPORT — Tennessee Democratic gubernatorial nominee Karl Dean pushed back Wednesday against GOP criticism of his TV ad talking about multiple rural hospital closings in the state. "Karl Dean talks about the importance of transparency but willingly spreads misinformation in his ads," Tennessee Republican Party Chairman Scott Golden said of the ad in an email. Dean has used the issue of rural hospital closings to make his case for Medicaid expansion, which Republican nominee Bill Lee opposes. 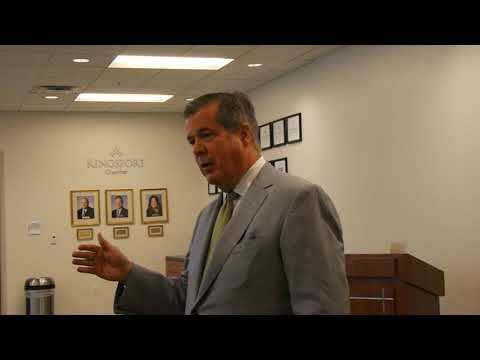 Dean, after a Kingsport Chamber meet-and-greet one day following his Kingsport debate with Lee, noted the ad has a film clip from a Nashville TV station reporting on the issue. The Tennessee Hospital Association claims there have been 10 rural hospital closures. A Tennessean newspaper fact check of the ad suggested three of the affected communities went through a merger or ownership change, while two changed service offerings. Does rural Tennessee need broadband? Do you favor teachers having firearms at school? What did you think of the federal raid on a slaughterhouse in Grainger County? Are you trying to emulate former Gov. Phil Bredesen, who was viewed as a successful governor? How did you like Tuesday’s debate? The debate drew about 1,400 people at the Toy F. Reid Employee Center at Eastman.